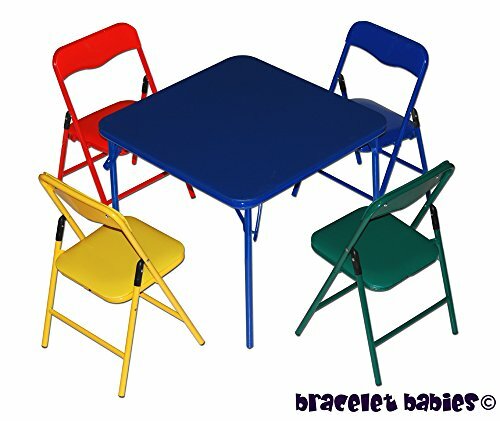 Children's Folding Table & Folding Chairs Furniture Set by Bracelet Babies© at Indsight. MPN: TSBTCC. Hurry! Limited time offer. Offer valid only while supplies last. The Bracelet Babies© Children's FOLDING TABLE w/FOLDING LEGS and 4 folding child sized chairs set is a must have for every parent and grandparent. The Bracelet Babies© Children's FOLDING TABLE w/FOLDING LEGS and 4 folding child sized chairs set is a must have for every parent and grandparent. (Cannot ship to AK, HI, PR or APO Box.) These wonderful chairs have PUSH BUTTON SAFETY LOCKS, padded seats for comfortable sitting, and the table FOLDS UP for convenient and easy storage. Children love the fun colors, and parents love the portability. The table stands about 21" off the ground and the top is about 24" x 24". The chairs' seats sit about 12" off the ground. The chairs' backs are about 22" from the ground. Cannot ship to AK, HI, PR or APO Box. Bracelet Babies© Chairs are PADDED and fold up for convenience and portability. Easy storage and table & chairs have RUBBER CAPS on the bottom of the legs to help prevent scratching floors. Blue Table + 1 each of Red, Blue, Green & Yellow chairs. Sturdy, Durable, and Fun for the Kids! If you have any questions about this product by Bracelet Babies©, contact us by completing and submitting the form below. If you are looking for a specif part number, please include it with your message. Disney Star Wars Darth Vader Z Table, 28 x 16 x 16"